FILE - The Wall Street sign is pictured in front of the New York Stock Exchange in New York City. A planned massive Republican tax overhaul has led Wall Street strategists to revise their 2018 corporate earnings forecasts sharply higher, but the jury is out on how long the accelerating effect on profits will last. The tax bill, which the U.S. House of Representatives approved on Tuesday, will cut the corporate income tax rate to 21 percent from 35 percent, beginning Jan. 1, and would be the biggest positive factor for U.S. earnings in 2018. A Senate vote was still awaited. Although there is a wide range of profit estimates for 2018, the expected tax plan benefit has strategists now calling for double-digit profit gains in 2018 over 2017, compared with their forecasts for mid-single-digit gains without the tax cuts. S&P 500 earnings growth for 2017 was an estimated 11.9 percent, according to Reuters data. Speaker of the House Paul Ryan, R-Wis., joined at right by House Ways and Means Committee Chairman Kevin Brady, R-Texas, meets reporters just after passing the Republican tax reform bill in the House of Representatives, on Capitol Hill, in Washington, Dec. 19, 2017. "This is going to drive the earnings numbers. [Tax] is going to overwhelm everything," said Credit Suisse Group U.S. Equity Strategist Jonathan Golub, who was waiting for the bill's passage to adjust his own earnings estimates. With the U.S. and world economies expanding, consumer demand strong and interest rates low, corporate profits were expected to be healthy next year. The tax law will give them an added jolt of adrenaline. Many strategists estimate the cut in corporate tax could deliver an extra boost to earnings next year of between about 7 percent to more than 10 percent. 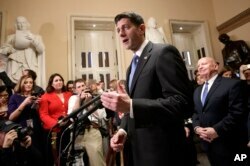 Some of the forecasts were based on a previous version of the legislation calling for a tax cut to 20 percent. In one of the most recent projections, UBS on Friday said it saw a potential 9.1 percent boost to S&P earnings per share because of the tax plan. It is unclear how great the lasting positive impact will be. "The retention of this benefit is unclear," said Savita Subramanian, Bank of America-Merrill Lynch's head of U.S. equity and quantitative strategy, who forecasts the plan could add $19, or about 14 percent, to S&P 500 earnings including potential paybacks from repatriation, with the net recurring benefit likely to be closer to $11, or 8 percent. Subramanian, in a presentation earlier this month, said companies may look to use the benefit for short-term lifts. For example, retailers, which have been suffering from competition from Amazon, may want to pass the benefit on with bigger sales and more promotions. "You have to wonder how much of that benefit you're going to really see float to the bottom line on a longer-term basis," Subramanian said. The boost to profits goes a long way to justify some of the rapid rise in stock valuations since Donald Trump's election as president a year ago. Stronger earnings mean less stretched price-to-earnings ratios. The S&P 500 has gained about 5 percent since mid-November when the House passed its tax overhaul bill, and is up about 20 percent year-to-date. Golub and others said after the initial boost to forecasts, the profit numbers could still drift higher in the months ahead as companies adjust their plans. "We'll get a big jump in '18, but the ripple effect of the tax bill could be the big surprise in the second half of '18," said Bucky Hellwig, senior vice president at BB&T Wealth Management in Birmingham, Alabama. "The tax cuts ... will give companies a lot more flexibility to do dividend increases, buybacks and hiring, and that's what's difficult to get a handle on," Hellwig said.